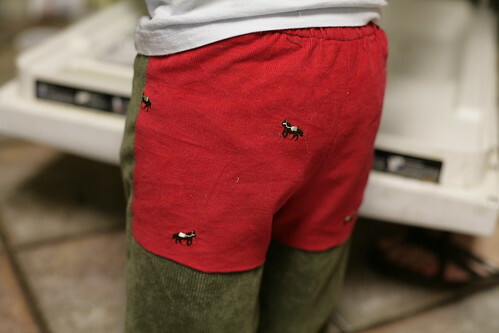 Inder Loves Folk Art: Autumn pants. After the coldest, foggiest, stupidest summer ever,* Northern California has had a gloriously warm and sunny autumn. I have been pretending that it will never end, and that I will be wearing breezy summer dresses all winter, but realistically, there are signs of fall in the air. The equinox was weeks ago. Yesterday we had our first rain of the season. Daylight savings is coming up soon. After a late start, the tomatoes are almost spent. I broke out my knee-high boots today. Time is passing. Sigh. I'm definitely a fan of long days and warm weather, so it's hard for me to see autumn as anything other than the beginning of months of wearing thick socks (in our badly insulated house) and leaving work well after it gets dark, ugh. But there are some definite perks to the season. Namely: Fall colors, and corduroy. The inspiration for these came from Anna Maria Horner's book Handmade Beginnings. Her "Quick Change Trousers" have a cute contrasting bottom. I love that pattern, but I wanted the contrasting panel to be larger, and I wasn't keen on making a pair of fully-lined, reversible pants (this is California, after all, not New England - the seasons don't change that much). So I used my go-to baby pants pattern (the "Huck Finn Pants" from Weekend Sewing), and simply cut the back pattern piece into two pieces, added seam allowance, and eyeballed some contrasting pony cuffs. Bad insulation or no, every time I just look at these, I get a warm, tingly, 1970s home-decor feeling. My only regret is that I could not applique pony-knee-patches onto them because I don't have enough fabric. Ah, well. Next time. Love, love, love the pants. I must learn to sew. Hmm, we have a new fabric store opening by my house~ perhaps they'll have classes. Anyhow...I'm with you on the fall sentiments. I love fall~ or used to~ before moving to Seattle. It now means time-to-prep-yourself-for-7-months-of-rain-and-being-dark-at-4pm. Sigh. 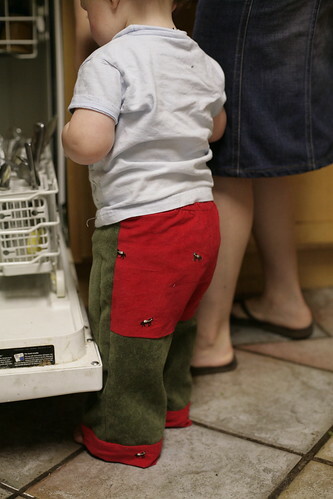 One reason I make so many elastic-waist baby pants is that they are a piece of cake - a perfect rank-beginner project!